John Moore/Getty ImagesDonald Trump Jr. and Vanessa Trump. 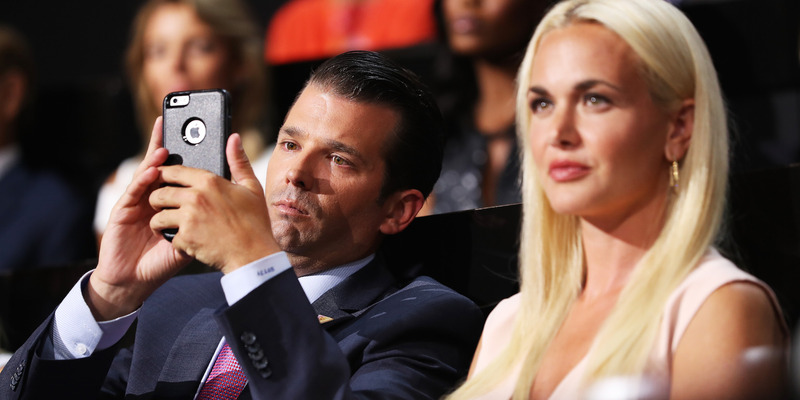 Vanessa Trump is reportedly filing for divorce from Donald Trump Jr.
Trump Jr.’s Twitter habits reportedly strained the marriage. An issue at the core of Vanessa Trump reportedly filing for divorce from Donald Trump Jr. on Thursday is his Twitter use, Page Six reported. Those concerns increased after Trump Jr. recently liked a tweet linking antidepressants to mass murder, and another pair of tweets questioning the motives of a teen survivor of the Marjory Stoneman Douglas High School mass shooting in Parkland, Florida. Page Six wrote Thursday that Vanessa and Trump Jr.’s marital problems were related to his travels and controversial tweets. Trump Jr. raised eyebrows when he liked the pair of tweets about the Parkland, Florida survivor, who had been at the center of a number of conspiracy theories following the tragic event. The second tweet was later deleted by its author, but it suggested that the survivor, David Hogg, was “running cover for his dad” who formerly served as an FBI agent in the Miami field office. The third tweet liked by Trump Jr., suggesting a connection between anti-depressants and mass murder, was posted by actor Rob Schneider in early March.